At PENN we are dedicated to providing the best possible customer service and are pleased to be joining the Florida Sportsman forum community. Please feel free to submit any questions regarding your PENN tackle and we will be happy to help. The anglers in this community are knowledgeable and we are excited to hear your thoughts. Additionally we invite you to provide your thoughts on the product line and look forward to bringing any insight the members have to our product team. Will there be a manual (bailless) pick up of the new spinfisher v 6500 made? Yes, it will be available in September of 2013 in the 6500 size as a stand alone reel. However anglers will be able purchase the kit to convert other size models from any PENN authorized service center or our factory service center. Do you know where I could see a picture of the manual reel at?? and thank you for the imformation. Hello, This is a field test reel. Sorry not the best quality photo but hopefully this helps. Thank you, I just wanted to see if would be made like the penn 706. with the spool in side the cup. Has any body else had problems with knob breaking off on the battle 4000? It has happen to me several times on the same reel which i bought for my daughter to use for yellow tailing. And does anybody out there recomend an after market knob i can install? I personally like the Battle products as i also own a pair of 5000's and an 8000 which i am extremely pleased with. But that 4000 knob break off every 4-5 months is driving me nuts. PM us with your contact info, we will send you out a new handle. Hi Penn, I bought a New Penn Senator Conventional Boat Combo (6-Feet 6-Inch, 30 Yard/50 Pound 113H/S113 1151520) From Amazon on the first of Jan.. It broke already. The spindle that the start drag threads on to is stripped.. This was the second time I was using it... I did land a big grouper the first time I used it, but I'm pretty sure this was a manufacturing flaw.. A quality control miss on the assembly line. The other threads that are not stripped are cut way shallow. Since it is through amazon that I bought this, what is the proper steps for getting this replaced ASAP. It looks like it is part number 1197430 for model 113h2. Thanks for your help in advance. If you are familar with Penn conventional reels we can send you a new gear sleeve, however if you have never taken apart this type of reel I would recommend sending it in to us to be fixed. Either way it will be covered under warranty. SORRY DO NOT REPLY I POSTED THIS WITHOUT REALIZING HOW TO MAKE A THREAD. Hi, I stripped the main gear on my fierce 4000 real after not much use. I was wondering if there is any replacement out there that would be better then the original? (From another real that would fit or just an upgrade part). Also, would putting in the ht100 washer increase the durability of the reel? Thanks Tony for sending the part without any Hassle. I will install it today. I appreciate your customer service. Hi, Tony. I recently purchased a TRQS9-G, primarily for use when fishing for large yellowfin tuna. While I was assured by my retailer that the reel I received was the latest version, it wasn't; it had a pin supporting the spool rather than a washer, and I was particularly concerned about whether the rotor arm was the newer version or the older arm that would bend and contact the spool at drag pressures above ~30 lbs. My retailer was of little help in rectifying the problem and suggested I contact Penn. As such, I contacted Jan Snow at Pure Fishing, who asked me to return the reel to Penn for an "under warranty upgrade." I did this and the reel's main shaft and spool support were replaced, but the rotor arm wasn't so I assumed I had received a reel with the improved rotor arm already installed. Today I purchased a TRQS5-G, and there is substantially more room between this reel's rotor arm and spool that there is in the TRQS9; I can easily slip a nickel between the spool and rotor arm in the TRQS5 but not the TRQS9. Jan told me that this is the way to tell whether the rotor arm was the improved version - my main concern when I sent the reel to Penn - and I can now clearly see what she was talking about. What should I do at this point? I'd rather not part with the reel for another few weeks, especially since yellowfin tuna season is rapidly approaching. Many thanks! If you could PM us with your name I will look into this for you. Thanks so much, Tony. I sent a personal message to you; it should be in your Florida Sportsman inbox. Tony, I wanted to thank you and Penn publicly for taking care of my TRQS9 situation. Nobody could ask for better support or assistance! Tony, just a quick follow-up: I received the new rotor arm this morning and installed it, and the distance between the arm and the TRQS9's spool has notably increased. I can now easily slide a nickel between the two. Again, thanks so much for all of your help. You've again demonstrated that Penn's service is second to none! I recently purchaced a squal 30 back in may and used it 4 times.After 3rd time the lever on the drag was going back farther than it should and I would have to play with it to get it to go in free spool and about the same time it started to make a noise when I reel up.So being under warranty still I sent back and had it fixed no questions asked great service and quick turn around.Unfortunatly the very next time I used it the same things are happening.I am one to really take care of my things so I don't know what the deal is?? I have heard nothing but good reviews (except from a buddy of mine that had the same issue with the lever drag) about this real and I am wondering if anyone is having the same issue or maybe we just got the defective ones out of a bunch? mukyman/snookangler - we had a bad run of handle knobs on the 3000/4000 size. It was a big problem last summer but we're still seeing a few out there. Happy to send you guys a replacement handle arm (no charge of course)....please PM us with shippping details if interested. I bought a new one and it held up to a tarpon. Cant wait for the spin fisher bail less kit to come out looking at getting one for big snook. I have a Van Staal vs100 and i am a fan of bail less reels. You guys should make a bailless sargus. Hi. I am interested in purchasing this rod/reel combo but I am a little hesitant. I really like this rod & reel combo & have spoken to a Penn rep last week about it. This Penn rep informed me I would need a Medium Heavy rod for the types of species I am targeting & the location. My concern was that the tip of this rod looks flimsy to me like it would break very easily if you hook a big fish. The Penn rep told me that he catches 15 lb. bass on it & no that would not happen. Last night while getting some live shrimp from my local bait & tackle shop, I see a bunch of brand new Penn Battles & Fierce rod & reels still in plastic (brand spanking new). I was asking about the pricing on this. A few minutes later 2 guys come into the tackle shop with a Penn Battle combo that they just bought from this tackle about a week ago but less then 10 days. The top had been broken off of it. I asked them if they were inshore or offshore when this happened. They said they were in the ocean & did not know what kind of fish they had but it was something big. This does not ease my mind. 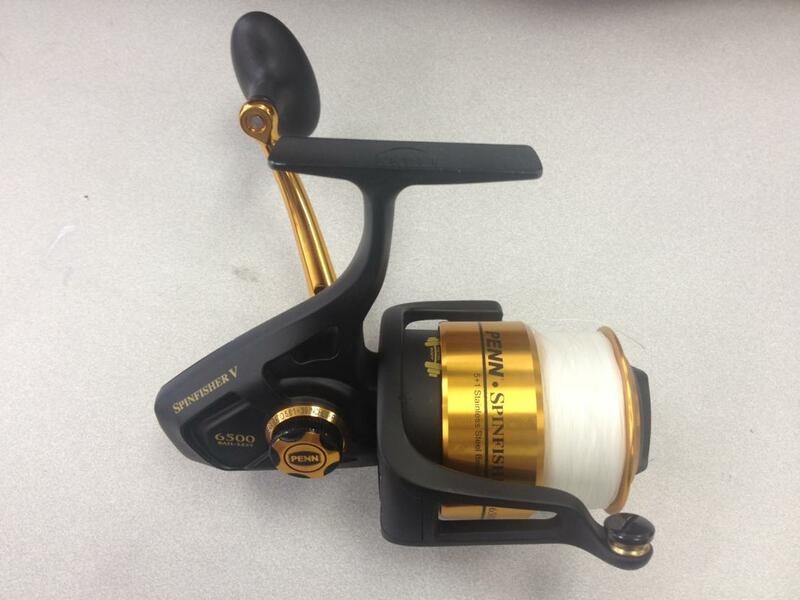 What type of warranty is there with this Penn Battle Spinning Combo (4000 Reel)? The type of fishing I do is strickly inshore from our dock near Port Everglades in Ft. Lauderdale. Species are snook, tarpon, jack crevalles, barracudas, mangrove snappers, lookdowns, catfish, pinfish, blowfish, etc. Really need my mind to be eased on this from Penn after this last night. A response would be appreciated. Thanks! For some reason I am getting NO response from Penn in this forum. If I don't get the courtesy of a response sooner or later, I will more then likely go without somebody else such as Shimano. Katwoman sorry for the delay in response, all PENN product caries a 1 year warranty but if you are to have any issues after your warranty has ran out we have several options to help get you back on the water quickly. The Battle combos are a great value for the $. You basically get a rod for a few $ more. The rods are graphite composite which mean they have both glass and graphite fibers in the blank which make them strong. When picking out your outfit just make sure you get the right combo to handle what you are doing. Based on the type of fishing you listed above I recommend going with the Battle 4000 combo with the 10-17lb rod. Please let me know if you have anymore questions. Sorry again for the delay in response. Thank You. I appreciate the response. I am waiting on a response on my lightly used but continuous rough grinding Spinfisher V 4500 that has never been under water. my penn rod broke when I casted it within the warranty time span.anything you can do? Go to the website "Pennreels.com", and click on service, then follow the menu to "rods". "The best kind of fish in the world is the one on the end of your line"